კეთილი იყოს თქვენი მობრძანება ფორუმზე! ფორუმი განკუთვნილია „ვიკიციტატიის“ ირგვლივ სხვადასხვა თემატიკის მოსაზრებების გამოხატვისა და საჯარო დიალოგის გამართვისთვის. ფორუმი მოსახერხებელი ადგილია იმ საკითხების განსახილველად, რომელიც „ვიკიციტატიის“ მთელ საზოგადოებას ეხება. ამგვარად არ დაგვჭირდება დებატებისათვის მომხმარებელთა განხილვის გვერდებისათვის მიმართვა. ჩაიხანა განხილვის თემების მიხედვით დაყოფილია რამდენიმე „კუთხედ“. სანამ ახალ თემას გახსნიდეთ, გთხოვთ გადახედოთ გვერდით მოყვანილ განყოფილებებს, შეამოწმეთ თუ თქვენთვის საინტერესო თემა უკვე განხილულია და, შესაბამისად, თქვენი მოსაზრება იმავე გვერდზე დაამატეთ. ძირითად გვერდზე ახალი თემის დასამატებლად აქ დააწკაპუნეთ. არ დაგავიწყდეთ ხელის მოწერა (გამოიყენეთ ~~~~). ახალი შეტყობინების დასატოვებლად აქ დააწკაპუნეთ. Did you know that you can now use the visual diff tool on any page? Sometimes, it is hard to see important changes in a wikitext diff. This screenshot of a wikitext diff (click to enlarge) shows that the paragraphs have been rearranged, but it does not highlight the removal of a word or the addition of a new sentence. If you enable the Beta Feature for "ვიზუალური სხვაობები", you will have a new option. It will give you a new box at the top of every diff page. This box will let you choose either diff system on any edit. Click the toggle button to switch between visual and wikitext diffs. In the visual diff, additions, removals, new links, and formatting changes will be highlighted. Other changes, such as changing the size of an image, are described in notes on the side. This screenshot shows the same edit as the wikitext diff. The visual diff highlights the removal of one word and the addition of a new sentence. You can read and help translate the user guide, which has more information about how to use the visual editor. Since the last newsletter, the Editing Team has spent most of their time supporting the 2017 wikitext editor mode, which is available inside the visual editor as a Beta Feature, and improving the visual diff tool. Their work board is available in Phabricator. You can find links to the work finished each week at mw:VisualEditor/Weekly triage meetings. Their current priorities are fixing bugs, supporting the 2017 wikitext editor, and improving the visual diff tool. The 2017 wikitext editor is available as a Beta Feature on desktop devices. It has the same toolbar as the visual editor and can use the citoid service and other modern tools. The team have been comparing the performance of different editing environments. They have studied how long it takes to open the page and start typing. The study uses data for more than one million edits during December and January. Some changes have been made to improve the speed of the 2017 wikitext editor and the visual editor. Recently, the 2017 wikitext editor opened fastest for most edits, and the 2010 WikiEditor was fastest for some edits. More information will be posted at mw:Contributors/Projects/Editing performance. The citoid service automatically translates URLs, DOIs, ISBNs, and PubMed id numbers into wikitext citation templates. It is very popular and useful to editors, although it can be a bit tricky to set up. Your wiki can have this service. Please read the instructions. You can ask the team to help you enable citoid at your wiki. The team will talk about editing tools at an upcoming Wikimedia Foundation metrics and activities meeting. 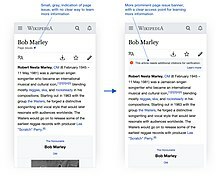 Wikibooks, Wikiversity, and other communities may have the visual editor made available by default to contributors. If your community wants this, then please contact Dan Garry. If you aren't reading this in your preferred language, then please help us with translations! Subscribe to the Translators mailing list or contact us directly. We will notify you when the next issue is ready for translation. გმადლობთ! From May 8, AdvancedSearch will be available as a beta feature in your wiki. The feature enhances the search page through an advanced parameters form and aims to make existing search options more visible and accessible for everyone. AdvancedSearch is a project by WMDE Technical Wishes. Everyone is invited to test the feature and we hope that it will serve you well in your work! Please help translate to your language Hi everyone. The Readers web team has recently begun working on exposing issue templates on the mobile website. Currently, details about issues with page content are generally hidden on the mobile website. This leaves readers unaware of the reliability of the pages they are reading. The goal of this project is to improve awareness of particular issues within an article on the mobile web. We will do this by changing the visual styling of page issues. The new treatment increases awareness of page issues among participants. This is true particularly when they are in a more evaluative/critical mode. Our next step would be to start implementing these changes. We wanted to reach out to you for any concerns, thoughts, and suggestions you might have before beginning development. Please visit the project page where we have more information and mockups of how this may look. Please leave feedback on the talk page. I'm preparing a change in who can edit sitewide CSS/JS pages. (These are pages like MediaWiki:Common.css and MediaWiki:Vector.js which are executed in the browser of all readers and editors.) Currently all administrators are able to edit these pages, which poses a serious and unnecessary security risk. Soon, a dedicated, smaller user group will take over this task. Your community will be able to decide who belongs in this group, so this should mean very little change for you. You can find out more and provide feedback at the consultation page on Meta. If you are involved in maintaining CSS/JS code, or policymaking around adminship requests, please give it a look! To improve the security of our readers and editors, permission handling for CSS/JS pages has changed. (These are pages like MediaWiki:Common.css and MediaWiki:Vector.js which contain code that is executed in the browsers of users of the site.) A new user group, interface-admin, has been created. Starting four weeks from now, only members of this group will be able edit CSS/JS pages that they do not own (that is, any page ending with .css or .js that is either in the MediaWiki: namespace or is another user's user subpage). You can learn more about the motivation behind the change here. Please add users who need to edit CSS/JS to the new group (this can be done the same way new administrators are added, by stewards or local bureaucrats). This is a dangerous permission; a malicious user or a hacker taking over the account of a careless interface-admin can abuse it in far worse ways than admin permissions could be abused. Please only assign it to users who need it, who are trusted by the community, and who follow common basic password and computer security practices (use strong passwords, do not reuse passwords, use two-factor authentication if possible, do not install software of questionable origin on your machine, use antivirus software if that's a standard thing in your environment). as announced previously, permission handling for CSS/JS pages has changed: only members of the interface-admin (ინტერფეისის ადმინისტრატორები) group, and a few highly privileged global groups such as stewards, can edit CSS/JS pages that they do not own (that is, any page ending with .css or .js that is either in the MediaWiki: namespace or is another user's user subpage). This is done to improve the security of readers and editors of Wikimedia projects. More information is available at Creation of separate user group for editing sitewide CSS/JS. If you encounter any unexpected problems, please contact me or file a bug. The Wikimedia Foundation will be testing its secondary data centre. This will make sure that Wikipedia and the other Wikimedia wikis can stay online even after a disaster. To make sure everything is working, the Wikimedia Technology department needs to do a planned test. This test will show if they can reliably switch from one data centre to the other. It requires many teams to prepare for the test and to be available to fix any unexpected problems. They will switch all traffic to the secondary data center on Wednesday, 12 September 2018. On Wednesday, 10 October 2018, they will switch back to the primary data center. Unfortunately, because of some limitations in MediaWiki, all editing must stop when we switch. We apologize for this disruption, and we are working to minimize it in the future. You will be able to read, but not edit, all wikis for a short period of time. You will not be able to edit for up to an hour on Wednesday, 12 September and Wednesday, 10 October. The test will start at 14:00 UTC (15:00 BST, 16:00 CEST, 10:00 EDT, 07:00 PDT, 23:00 JST, and in New Zealand at 02:00 NZST on Thursday 13 September and Thursday 11 October). If you try to edit or save during these times, you will see an error message. We hope that no edits will be lost during these minutes, but we can't guarantee it. If you see the error message, then please wait until everything is back to normal. Then you should be able to save your edit. But, we recommend that you make a copy of your changes first, just in case. Background jobs will be slower and some may be dropped. Red links might not be updated as quickly as normal. If you create an article that is already linked somewhere else, the link will stay red longer than usual. Some long-running scripts will have to be stopped. There will be code freezes for the weeks of 10 September 2018 and 8 October 2018. Non-essential code deployments will not happen. This has been posted here because your wiki allows local file uploads. Please help translate to your language. Commons will no longer allow uploads of photos, paintings, drawings, audio and video that use the GFDL license and no other license. This starts after 14 October. Textbooks, manuals and logos, diagrams and screenshots from GFDL software manuals that only use the GFDL license are still allowed. Files licensed with both GFDL and an accepted license like Creative Commons BY-SA are still allowed. There is no time limit to move files from other projects to Commons. The licensing date is all that counts. It doesn't matter when the file was uploaded or created. Every wiki that allows local uploads should check if bots, scripts and templates that are used to move files to Commons need to be updated. Also update your local policy documentation if needed. The Community Wishlist Survey. Please help translate to your language. The Community Wishlist Survey is the process when the Wikimedia communities decide what the Wikimedia Foundation Community Tech should work on over the next year. The Community Tech team is focused on tools for experienced Wikimedia editors. You can post technical proposals from now until 11 November. The communities will vote on the proposals between 16 November and 30 November. You can read more on the wishlist survey page. Did you know that you can use the visual editor on a mobile device? Tap on the pencil icon to start editing. The page will probably open in the wikitext editor. You will see another pencil icon in the toolbar. 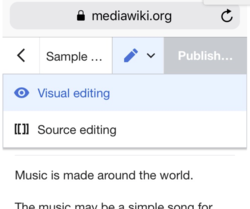 Tap on that pencil icon to the switch between visual editing and wikitext editing. Remember to publish your changes when you're done. Since the last newsletter, the Editing Team has wrapped up most of their work on the 2017 wikitext editor and the visual diff tool. The team has begun investigating the needs of editors who use mobile devices. Their work board is available in Phabricator. Their current priorities are fixing bugs and improving mobile editing. The Editing team has published an initial report about mobile editing. The Editing team has begun a design study of visual editing on the mobile website. New editors have trouble doing basic tasks on a smartphone, such as adding links to Wikipedia articles. You can read the report. The Reading team is working on a separate mobile-based contributions project. The 2006 wikitext editor is no longer supported. If you used that toolbar, then you will no longer see any toolbar. You may choose another editing tool in your editing preferences, local gadgets, or beta features. The Editing team described the history and status of VisualEditor in this recorded public presentation (starting at 29 minutes, 30 seconds). The Editing team wants to improve visual editing on the mobile website. Please read their ideas and tell the team what you think would help editors who use the mobile site. The Community Wishlist Survey begins next week. In a few weeks the Readers web team will be changing how some templates look on the mobile web site. We will make these templates more noticeable when viewing the article. We ask for your help in updating any templates that don't look correct. What kind of templates? Specifically templates that notify readers and contributors about issues with the content of an article – the text and information in the article. Examples like Template:Unreferenced or Template:More citations needed. Right now these notifications are hidden behind a link under the title of an article. We will format templates like these (mostly those that use Template:Ambox or message box templates in general) to show a short summary under the page title. You can tap on the "Learn more" link to get more information. For template editors we have some recommendations on how to make templates that are mobile-friendly and also further documentation on our work so far. If you have questions about formatting templates for mobile, please leave a note on the project talk page or file a task in Phabricator and we will help you. The Community Tech team is focused on tools for experienced Wikimedia editors. The communities have now posted a long list of technical proposals. You can vote on the proposals from now until 30 November. You can read more on the wishlist survey page. Advanced Search will become a default feature on your wiki on November 28. This new interface allows you to perform specialized searches on the search page, even if you don’t know any search syntax. Advanced Search originates from the German Community’s Technical Wishes project. It's already a default feature on German, Arabic, Farsi and Hungarian Wikipedia. Besides, more than 40.000 users across all wikis have tested the beta version. Feedback is welcome on the central feedback page. ფონდ ვიკიმედიის უსაფრთხოების გუნდი ახორციელებს ახორციელებს ახალი პაროლის პოლიტიკისა და მოთხოვნების დანერგვას. გაეცანით უფრო მეტს პროექტის შესახებ MediaWiki.org-ზე. ახალი მოთხოვნები იქნება გამოყენებული ახალი და პრივილიგირებული ანგარიშების მიმართ. ახალ ანგარიშიებს მოეთხოვება შექმნან მინიმუმ 8 სიმბოლოსგან შემდგარი პაროლი. პრივილეგირებულ ანგარიშებს მოეთხოვებათ მათი პაროლის განახლება, სადაც პაროლის სიგრძე იქნება 10 სიმბოლო. ეს ცვლილებების გეგმის თანახმად უნდა ამოქმედდეს 13 დეკემბერს. თუ ფიქრობთ, რომ თქვენი სამუშაო ან ხელსაწყო იზარალებს ამით, გთხოვთ გაგვაგებინოთ განხილვის გვერდზე. Love is an important subject for humanity and it is expressed in different cultures and regions in different ways across the world through different gestures, ceremonies, festivals and to document expression of this rich and beautiful emotion, we need your help so we can share and spread the depth of cultures that each region has, the best of how people of that region, celebrate love. Wiki Loves Love (WLL) is an international photography competition of Wikimedia Commons with the subject love testimonials happening in the month of February. The primary goal of the competition is to document love testimonials through human cultural diversity such as monuments, ceremonies, snapshot of tender gesture, and miscellaneous objects used as symbol of love; to illustrate articles in the worldwide free encyclopedia Wikipedia, and other Wikimedia Foundation (WMF) projects. The theme of 2019 iteration is Celebrations, Festivals, Ceremonies and rituals of love. Sign up your affiliate or individually at Participants page. Imagine... the sum of all love! A new beta feature will soon be released on all wikis: The FileExporter. It allows exports of files from a local wiki to Wikimedia Commons, including their file history and page history. Which files can be exported is defined by each wiki's community: Please check your wiki's configuration file if you want to use this feature. The FileExporter has already been a beta feature on mediawiki.org, meta.wikimedia, deWP, faWP, arWP, koWP and on wikisource.org. After some functionality was added, it's now becoming a beta feature on all wikis. Deployment is planned for January 16. More information can be found on the project page. As always, feedback is highly appreciated. If you want to test the FileExporter, please activate it in your user preferences. The best place for feedback is the central talk page. Thank you from Wikimedia Deutschland's Technical Wishes project. The Wikimedia Foundation is planning a global consultation about communication. The goal is to bring Wikimedians and wiki-minded people together to improve tools for communication. We want all contributors to be able to talk to each other on the wikis, whatever their experience, their skills or their devices. We are looking for input from as many different parts of the Wikimedia community as possible. It will come from multiple projects, in multiple languages, and with multiple perspectives. We are currently planning the consultation. We need your help. We need volunteers to help talk to their communities or user groups. First, sign up your group here. Next, create a page (or a section on a Village pump, or an e-mail thread – whatever is natural for your group) to collect information from other people in your group. This is not a vote or decision-making discussion: we are just collecting feedback. When you want to discuss a topic with your community, what tools work for you, and what problems block you? What about talk pages works for newcomers, and what blocks them? What do others struggle with in your community about talk pages? What do you wish you could do on talk pages, but can't due to the technical limitations? What are the important aspects of a "wiki discussion"? 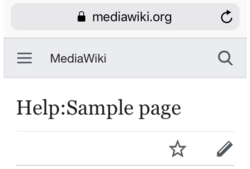 Finally, please go to Talk pages consultation 2019 on Mediawiki.org and report what you learned from your group. Please include links if the discussion is available to the public. You can also help build the list of the many different ways people talk to each other. Not all groups active on wikis or around wikis use the same way to discuss things: it can happen on wiki, on social networks, through external tools... Tell us how your group communicates. You can read more about the overall process on mediawiki.org. If you have questions or ideas, you can leave feedback about the consultation process in the language you prefer. Thank you! We're looking forward to talking with you. ეს გვერდი ბოლოს დარედაქტირდა: 17:35, 12 აპრილი 2019.